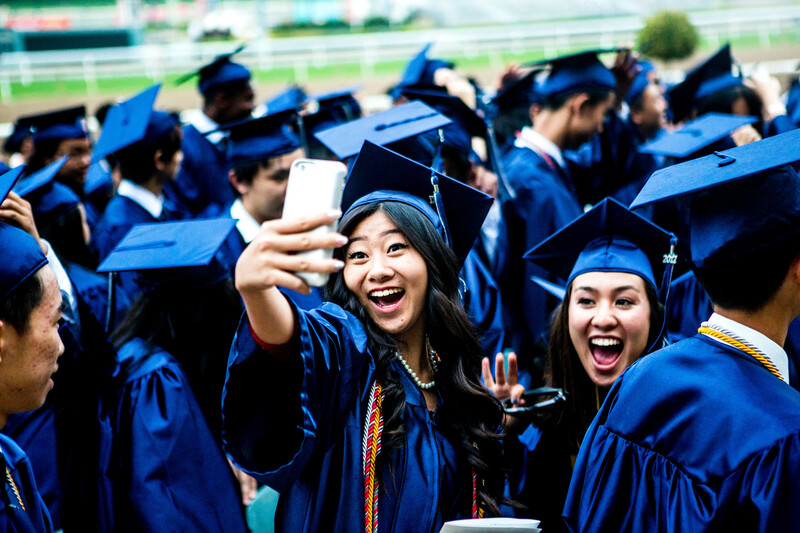 SAN GABRIEL, CA – San Gabriel Unified School District honored nearly 500 graduates from Gabrielino and Del Mar high schools during commencement ceremonies on May 31 and June 1, celebrating the Class of 2017’s progress toward new academic and professional pathways. Gabrielino High School’s 458 seniors culminated their high school experience with a commencement ceremony on May 31 at Santa Anita Park. Valedictorian Dylan Ngo, a league champion swimmer who was named an AP Scholar with Distinction and National Merit Commended Scholar, will study neuroscience and computer science at Brown University. Salutatorian Andy Liao, a Red Cross club and computer science club member, will study math or science at UCLA. Graduate Maya Kusunoki-Martin reflected on Gabrielino’s 2017 motto, “Creating Opportunities,” as she addressed her peers, urging them not to shy away from academic challenges. Nearly 94 percent of Gabrielino’s graduates will pursue post-secondary education at institutions that include the Massachusetts Institute of Technology, Grinnell College, Stanford University, Pomona College and UC Berkeley. Del Mar High School honored 30 graduates who overcame personal and academic challenges during an emotionally charged commencement and senior awards ceremony on June 1 at Gabrielino High School. Thirteen graduates were also awarded scholarships worth a combined $5,000 from community organizations, including the Kiwanis Club of San Gabriel, West San Gabriel Valley Association of Realtors, Sunny Slope Water District and San Gabriel Special Needs Committee. All of Del Mar’s 30 graduates have taken steps to pursue post-secondary education. 060717_SANGAB_GRAD1: Gabrielino High School held its commencement ceremony on May 31, honoring 458 graduates eager to embark on the path toward college and careers. 060717_SANGAB_GRAD2: Thirty Del Mar High School students flipped their tassels and celebrated their successful pursuit of a diploma during an emotional graduation ceremony on June 1. Gabrielino High School held its commencement ceremony on May 31, honoring 458 graduates eager to embark on the path toward college and careers. Thirty Del Mar High School students flipped their tassels and celebrated their successful pursuit of a diploma during an emotional graduation ceremony on June 1.